Halestorm is back with a new album, “Vicious,” due out July 27 via Atlantic Records. Lzzy Hale and the crew debuted the album’s first single, “Uncomfortable,” this morning (May 30), and the track is streaming now via YouTube. Watch the video, which was directed by Evan Brace (Phantogram, Taking Back Sunday), below. Halestorm recorded “Vicious” earlier this year at Rock Falcon in Nashville, Tennessee, with producer Nick Raskulinecz, who has worked with Rush, Foo Fighters and Alice In Chains. The album is available for pre-order via all the usual digital outlets, and pre-orders come with an instant download of “Uncomfortable.” For those who want an extra boost, deluxe album packages are available for pre-order via the band’s official webstore, with some optioins including the new album on standard vinyl and limited edition opaque purple colored double vinyl. The band is also offering special merchandise at their webstore, such as a limited edition T-shirt, necklace, autographed poster and free album cover magnet with a physical album purchase. 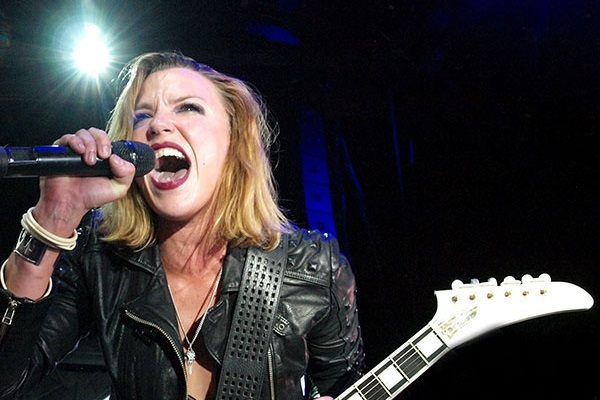 In other news, Halestorm will kick off the second leg of their major U.S. tour featuring exclusively female-fronted hard rock bands starting July 27 in Kansas City, Montana, and running through the end of August. The tour features Halestorm and In This Moment co-headlining the bill, as well as New Year’s Day. The tour will also hit a handful of North American festivals, such as Rock USA in Oshkosh, Wisconsin, on July 12, Rock Fest in Cadott, Wisconsin, on July 13; the Dubuque County Fair in Dubuque, Iowa, on July 28; and the Illinois State Fair in Springfield, Illinois, on Aug. 11. “Vicious” is Halestorm’s follow-up to their 2015 studio album, “Into the Wild Life,” which debuted inside the top five on the Billboard 200 chart. The album spawned the rock hits “Apocalyptic,” “Amen” and “I Am the Fire.” For more on “Vicious,” head to HalestormRocks.com.